CNA wraps up for 2016! 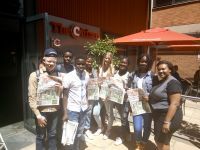 On Thursday and Friday the 8th and 9th of December, the Children's News Agency held its last workshop and wrapped up for the year at the Institute for the Advancement of Journlaism in Johannesburg. On Thursday 06 October, members of the CNA took the day off to visit Caxton Printers and The Citizen in Industria West, Johannesburg. Preparing for an interview? Need some Tips? We’ve got you covered. If you are preparing for an interview there are a few tips that we can suggest to help you do it to the best of your abilities. There are certain things you should keep in mind pre, during and post interview to make sure that you are not only well-prepared but that you also think through how to conduct yourself in a professional manner and ask questions that will really add value to your story. Barnato Park High School and Parktown Girls' High School attended The CNA's first training workshop for 2016 during the month of August. 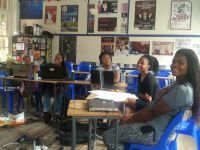 The CNA held a writing workshop during the October holidays to work on new stories which will be published in October. Tweets about "from:U18MattersZA OR from:MediaMattersZA OR from:MMA_tweeter"